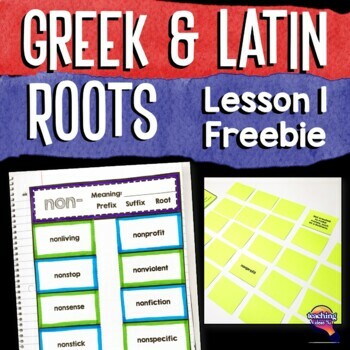 Greek & Latin Root Study Week 1 non- FREEBIE 5 Days of Activities! This is a complete week-long morphology study of Greek & Latin word parts. I personally use this for both vocabulary and spelling. I found that having separate word lists was often overwhelming for students, so I wanted to combined them into one list. 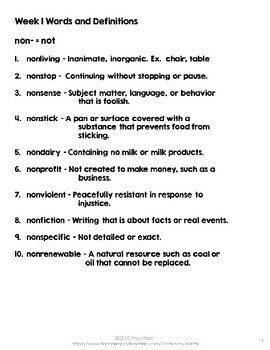 This week features the prefix non- and 10 vocabulary words. The list could easily be cut to fewer words. This unit was design with grades 4-5 in mind. It would also work well in grades 6-8, but I am not sure it would work as well in 3rd grade. The first week is FREE in order to see if this unit will meet your needs. In the quarterly units, a variety of activities are included. Students will not want to do the same activity week after week, so I tried to vary the activities for each week. For example, each week has an activity, such as dominoes, a match game, puzzles, pictionary, and color by numbers. 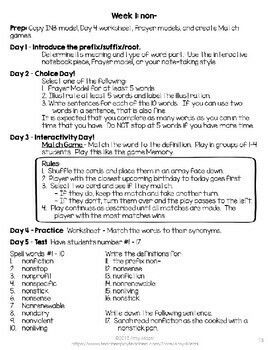 The worksheets include matching definitions, synonyms, crossword, fill in the sentence, and analogies. Units 1 - 4 are available in a 40 week bundle. Buying the bundle save 20% over the cover price of each quarter. The bundle can be found HERE.